Buenos Aires-Ezeiza International airport is the main commercial airport in the southern Latin American country, Argentina. 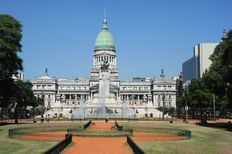 It is located in Ezeiza, a western suburb of the metropolitan area of ​​Gran Buenos Aires", which with 13 million inhabitants, is one of the largest greater city areas in Latin America. Besides Ezeiza, Buenos Aires also has another airport that is used for all national scheduled flights from Buenos Aires: Jorge Newbery airport. The airport is located on the A001 motorway (Autopista Richieri), about 22 km or 13 miles south west of downtown Buenos Aires.